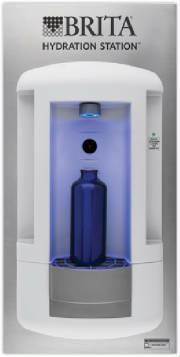 The Brita® Hydration Station™ offers a convenient, touch-free alternative to bottled water, filling up reusable containers with healthier, refreshing water.The wall-mounted unit conveniently mounts directly onto your facility’s wall, keeping hallways and breakrooms clean and clutter free. Unlike 5-gallon jugs, the unit connects directly to plumbing lines and never runs out of great-tasting, Brita® filtered water. And you won’t have to worry about expensive water delivery services or storing 5-gallon water jugs. Recessed Mount - Model 2000S Model 2000S mounts directly inside a wall between standard 16" studs, creating a flush, aesthetically pleasing installation. Designed for high-traffic areas such as schools, offices, and transport centers, the unit provides a practical solution for permanent applications. The unit features a plumbed drain and self-activated 24-hour water purge feature. And it meets the American with Disabilities Act (ADA) when mounted at the correct height.